Looking into obtaining this abhisheka had been on my mind for a while. Aware of the rarity of the Chakrasamvara Abhisheka being offered in the Shambhala community, I checked with Larry Mermelstein to see if he had any ideas who else might be offering it. He hadn’t heard of anything specific, but did have a list of students who were interested in furthering their Kagyü vajrayana practice and if I heard anything, to please let him know. 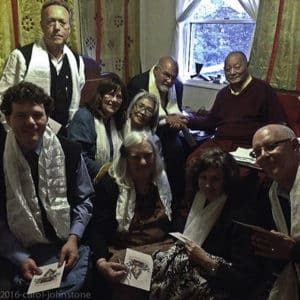 “I was told by an old sangha friend to check with Karma Triyana Dharmachakra (HH Karmapa’s New York Centre) and see when they might next be offering a ceremony for entrance to the three-year retreat, which would then also offer all the appropriate abhishekas, Chakrasamvara being one of them. Another sangha friend gave me Lama Tsultrim’s name and contact address. So, on May 13, 2016, I wrote to him requesting permission to join the three-year retreatants in the Chakrasamvara Abhisheka. 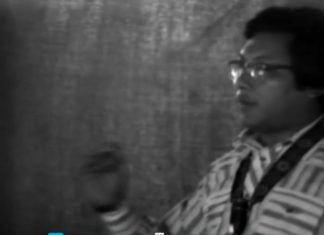 Initially he asked my background and said that I would have to have a letter from my teacher to give Khenpo Karthar requesting this empowerment. He noted that without this letter, I would be unlikely to get his permission. 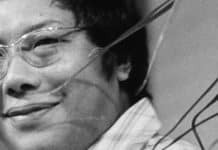 I immediately wrote back to him, telling him the Vidyadhara Chögyam Trungpa Rinpoche was my teacher, so getting a letter would be rather difficult! 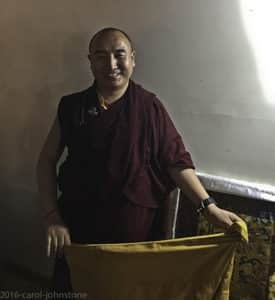 He wrote back within a few hours saying he had auspiciously run into Khenpo Karthar, telling him my background, and the Khenpo gave his approval to attend. 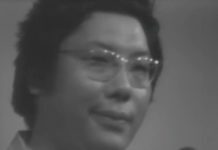 I became a student of Trungpa Rinpoche in 1972, and have slogged along on the path ever since. The last few years, I’ve focused on completing the Vajrayogini practice requirements, so the next step was to attend a Chakrasamvara Abhisheka. Many of us were able to sit in chairs in the back of the shrine room per Matt’s request (for the Abhisheka), given our advanced ages. In front were students from Karmê Ling and retreatants, including a contingent of about ten or so Chinese students. His Eminence spoke in English, and the translation went first to Tibetan and then to Chinese! His Eminence had fun explaining English slang to Ani Lodrö Lhamo, our translator, so she could choose the appropriate idioms in her translations. She was one of our contacts and had been a student of Khenpo Karthar since 1990. 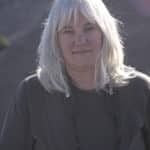 She is also the women’s retreat master.
. . . just this morning and frequently since, my mind drifts back to Tai Situ Rinpoche’s unexpected (by us) audience reminding us of our mahasiddha connections . . . to Khenpo Karthar’s kindness . 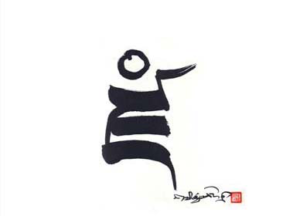 . . to Tulku Damcho Rinpoche’s cheerful, relaxed, powerful, and seeming effortless transmission . . . and to the wonder of that three-year retreat facility with its sangha of deeply connected, experienced practitioners, and not least of all to charmingly wacky Buena Vista motel, the Blue Bee Deli, and our small precious party from Shambhala. It was not easy . . . to get there . . . to be there at times . . . but then nothing worthwhile hardly is. Tulku Damcho Rinpoche gave the Chakrasamvara and Mahakala Abhishekas with a great sense of humility and humor. 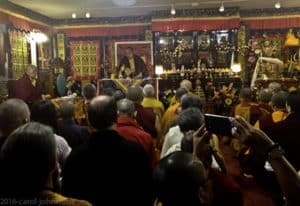 Some of us were given the extraordinary chance to spend a few moments with Khenpo Karthar, which felt like a special crown jewel to top-off to the amazing hospitality given to all of us during this time. My love to everyone in our dharma family!!! 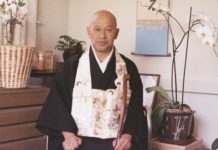 It has been 20 years since I first sat zazen, and here I was (after a few thousand hours of hearing, contemplating and meditating), on the way to the most anticipated empowerment of my life. I have always wished to be part of the club of Chakrasamvara practicing mahasiddhas, always! It was my heart’s desire, and though like a good watchman, I have tried constantly to let it lie, give it up, drop it and let it go, this desire, like an illicit thief, kept returning in the night to pilfer my resolve. These last months were tight, my antenna hair were vibrating with anticipation and the recognition that this too might never happen; I was weary of possible obstructions since I had waited years to attend this meeting, and who knows how many more I would have to wait if one of a dozen links in the chain just melted as it so often had. What if I hadn’t filled in the necessary immigration form by happy chance online the day before, or simply our car gave out on the way and we were stranded miles from Del-high? Yep, this was a trying time: a life sliding along the sword edge between fantasy and banal eventualities. The Catskills is a wonderful juicy place to have a retreat center and an Abhisheka. The land is fecund and you can feel it oozing its riches as you wind along the rolling valleys and hills. 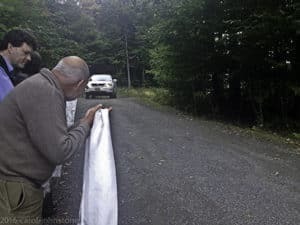 We got to Karmê Ling at around eleven thirty a.m., about an hour into a pep talk that Tai Situ Rinpoche was giving to the three-year retreatants just before they were to enter their long self-imposed isolation. From this point on, I think I just smiled in a happy daze. It has been in the past a warm pleasure to stand on grounds that were proclaiming and especially practicing the meditation style I am affiliated with, and here this feeling was no different. 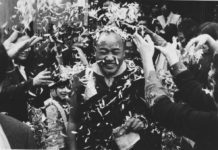 I love mahamudra, if you can say that, and the trees were dripping with it as myriad dharma flags fluttered in the wind, pulling down auspiciousness from the overcast heavens. I know of course all this is just a projection and it is my mind only that is dreaming. But what do you do when you have arrived where you want to be? 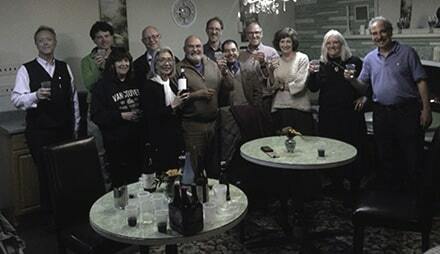 How did glacial time move when we congregated at this singular gathering? You kind of miss everything while experience haptically sinks into the bones through auxiliary sensory mechanisms. One has but shadows or traces left to remind one that one was there. It is making love to someone you still don’t know awfully well and the bubbly sounds, oriental smells, demanding touch, devouring eyes and sweet salty tastes cloak you; impressions still singe and throb—are imprinted on your ayatanas—long after you have parted. Before I knew it, we were retracing our steps, and a wry smile replaced the apprehensive longing of a dog who anticipates a succulent bone. In my hotel room waiting for a plane back to my abode some 4,700 miles away, I am assessing the goodies I took away from the empowerments and I propose they will probably influence my meditation practice for the rest of my life. A warm glow of devotion sets in as I begin to relax into a not-knowing openness, where the burden of desire is substituted by a thankfulness that I met my guru and he kicked me hard enough for me to reach this rare place; no doubt that whack will send me further on this trajectory as I enter the action. E Ma Ho! 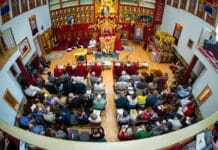 The Abhisheka itself took two days and was held in the shrine room of the men’s retreat residence at Karmê Ling. The shrine room was square and taller that it was wide, with many beautiful thangkas hanging on the walls. 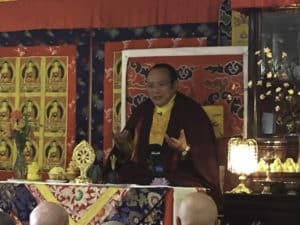 Tulku Damcho was recognized by His Eminence Tai Situ Rinpoche as the reincarnation of Lama Tsoknyi and is the dharma heir to Khenchen Thrangu Rinpoche. 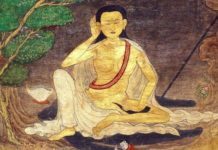 The Vidyadhara requested Thrangu Rinpoche to become the Abbott of Gampo Abbey and authorized him to give these abhishekas to our sangha, he but was unable to do that at this time. Lama Tsultrim Gyaltsen is currently a teacher in the men’s retreat house at Karmê Ling where we took the abhisheka. 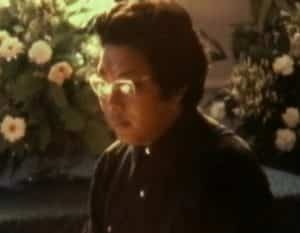 He took refuge with Khenpo Karthar Rinpoche in 1984, and received ordination in 2008 from Khenchen Thrangu Rinpoche.